We use recycled, repurposed wine bottles that are cut and sanded. They can be used later as drinking glasses or storage. We are also introducing the wooden wick which give a wonderful crackling sound. 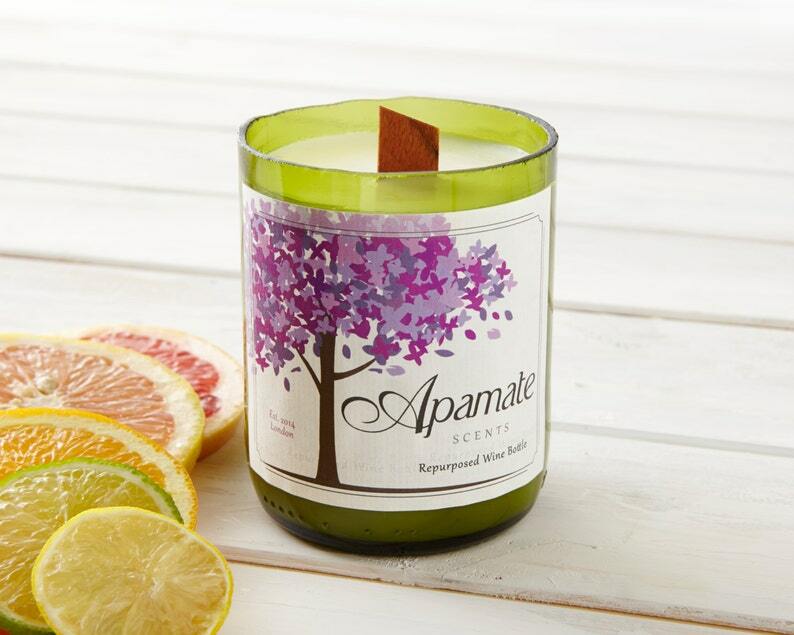 The sweet orange oil has a sweet fresh and tangy smell. It brings happiness and warmth, while the plant of lemongrass helps to revitalise a tired body and mind. We are using 100% soy bean because it is environmentally friendly, carbon neutral and also offers a softer and slower melting point. 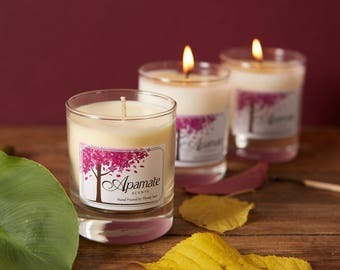 We add essential oils and / or organic oils to our candles. As well as having a beautiful aroma these oils also have natural and therapeutic benefits for the human body. These oils are extracted from flowers, leaves, roots, seeds and woods. * Please put your candle on a flat area/surface so the candle can burn evenly. * When the candle is lit for the first time, allow it to burn between 3 and 4 hours in order to make sure that the wax has liquefied across the surface to the sides. This procedure is done to avoid making a "hole" or a "tunnel" in the candle. * Avoid burning the candle for more than 4 hours at a time. 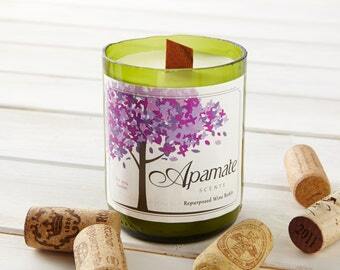 This lovely wine candle comes in a tube brown kraft box and gift wrapped in grey or purple wrapping paper, and covered with tissue paper. Your parcel will be shipped with Royal Mail, 2nd class recorded delivery (times below) unless you would like to receive sooner, in which case please message me. Burning time: 50 hours appox.